Mix butter, milk, sugar and salt. Cook to soft ball stage,stirring constantly. Remove from heat. Add peanut butter and marshmallow cream. Mix well. Makes 5 1/2 pounds. Mash all but one package of cheese together and add to a Casserole Crockpot (regular will work). 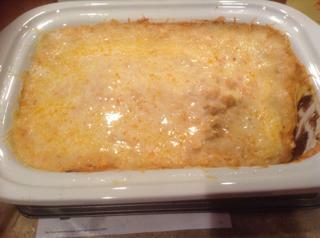 Spread out and add the second package of shredded cheese evenly over the top. Two hours on high, rest of time on low. YUM! Add the frozen potatoes to a 6.5-7 quart crock pot. Mix the other ingredients and add to the potatoes. Stir well. Cover pot and set to high for one hour. After one hour stir well again. The potatoes should break down into small bits. Turn the pot on low and cook until you're ready to eat. We have it on low 3 or 4 hours. Yum Yum - this recipe is a keeper! Spread the 2 cans of refried beans in bottom of pan. Crush chips and pour on top of beans. Mix 2 cups of the cheese with the rest of the above and pour on top of the chips. Spread the remaining cheese on top. Bake in a 350 oven for 40 minutes, or, if you are using the new casserole crockpot, 1.25 hours on high or 3 hours on low.